Porsche won't add a car below the Boxster, executives say. ELMAU, Germany -- Don't expect Porsche and its partner, Volkswagen, to develop a small sports car together, say Porsche executives. Porsche is the VW group's largest shareholder and increasingly will share components with the VW and Audi brands. But Klaus Berning, board member for sales and marketing at Porsche ,says, "There is no business case for Porsche in small cars." "It isn't that we haven't analyzed the possibilities," he says. "A small car has to meet our internal profit goals, and we have to make money on every car we sell. A small car does not fit in." 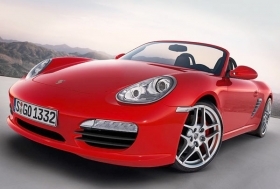 Says Detlev von Platen, CEO of Porsche Cars North America: "We won't go with a smaller baby Boxster because we cannot afford it -- we are not a volume car manufacturer." Von Platen would not confirm reports that Porsche is considering a four-cylinder engine from Audi's TTS roadster for the mid-engine Boxster. "What we are considering and looking at very closely is downsizing trends we see in engines," he said. Von Platen said a four-cylinder is possible, but Porsche also could squeeze more economy out of a V-6. A new Porsche V-6 debuts next year on the Panamera. The real economies of scale come from sharing basic architectures with the VW group -- especially the electronic platform of a vehicle, say Porsche executives. The Panamera, which goes on sale in October, shares more than half of its electronic components with Audi vehicles, said Michael Steiner, product director for the Panamera.